In the past few months the signals on Sino Indian relations are confusing to say the least. The Sino Indian border stand off has led to a series of debates between the media and officials on the capacity of the Indian military to counter a resurgent China on the Himalayan frontier. A preliminary survey of the activities of the Indian armed forces would reveal that they are fully ready and capable to meet the China challenge. Firstly there have been consistent efforts by top officials of the government including the National Security Adviser and the Chief of the Army Staff to talk down the China threat hyped by the media. Even influential national editors as Shekhar Gupta of the Indian Express joined in the diffusion chorus. The National Security Adviser disagreed that China was a major concern thus, “India of 2009 is not (India) of 1962”. “In terms of number of incursions, there has been hardly any increase. Occasionally inroads are a little deeper than what it might have been in the past. I don’t think so that there is anything alarming about it. I think we have a good understanding about the whole issue,” Narayanan said. He also expressed concern over media hype creating misunderstandings thus, “I have been through 1962. I was aware of the problem then.... What we need to be careful of is that we don’t have an unwarranted incident or an accident of some kind." The Foreign Secretary Ms Nirupama Rao who was the ambassador to Beijing before she took over in New Delhi stated that the Establishments of the two countries were in constant touch. 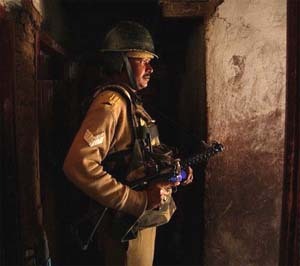 Army chief Gen Deepak Kapoor had also indicated separately the same day that there was no increase in the number of intrusions as compared to last year. "There is no cause for worry or concern." A division based in Upper Assam or central Nagaland provides multiple options for employment for counter insurgency as well as a counter offensive role in Arunachal Pradesh, with easy accessibility to the Lohit and Dibang valley in eastern Arunachal. With the 27 Mountain Division having returned to its locations in Sikkim after a long stint in Jammu and Kashmir on the counter insurgency grid, the defensive posture has also been strengthened. Infrastructure particularly roads are also being upgraded though the process is slow. In Arunachal Pradesh of the 11 roads, only 9 have been cleared so far, while two more are pending. Of the total 27 roads being constructed on the Chinese border, work is in progress on 10 border roads. Mobilization of troops has taken place on the Sino Indian border for routine operational alert. Operation Pralay an operational validation exercise was reportedly conducted by the Army and the Air Force in Assam and Arunachal Pradesh for three days with participation of front line fighters as Sukhoi, Mirage-2000, MiG-29, MiG-27 and IL-78 air-to-air refueling planes as per Defence Ministry sources quoted by the media. The IAF's Shillong-based Eastern Air Command and the army's Eastern Command in Kolkata coordinated the exercise. The Western Air Command (WAC) chief Air Marshal N A K Browne told reporters in the capital on 25 September that different types of radars would be put in place along the 667-kmn Line of Actual LAC with China, "The Air Force is keenly examining the option of special type of radars, which we call the mountain radars and we are also looking at Low Level Light Weight Radars (LLLWR). So there is a definite plan." Browne said "When I talk of operational infrastructure to be improved in the northern sector, the mountainous terrain is very tricky. Because you have huge peaks and normal conventional systems are very difficult to maintain there," he said. IAF had already given contracts for 19 of LLLWRs and that the WAC itself had some of these. "More are in the pipeline. They are coming starting from next year itself," he added. The IAF has placed along the LAC two Rohini radars developed by DRDO and manufactured by BEL. "One more Rohini radar is to be inducted next year and placed along the LAC," he said. "These, I think, will take care of detection of any threats that come from across the LAC," he added. In a significant move by the Indian Air Force, an AN-32 aircraft landed at Nyoma Advanced Landing Ground (ALG) during the month. Group Captain SC Chafekar touched down on the Nyoma airstrip located at an altitude of 13,300 feet with Air Marshal NAK Browne, Air Officer Commanding-in-Chief, Western Air Command and Lieutenant General PC Bharadwaj, then General Officer Commanding-in-Chief, Northern Command and now the Vice Chief of the Army Staff on board. Though helicopters have been landing at this ALG, this is for the first time that a fixed wing aircraft has landed at the compacted airstrip of Nyoma, located 23 kms from the LAC. After deliberating on all aspects and carrying out aerial and ground reccees, it was concluded that Nyoma could be developed for fixed wing operations as well. The herculean task of developing the ALG to the standards required for fixed wing operations was undertaken by the Engineer Regiments of 14 Corps. The successful landing of a fixed wing aircraft at Nyoma marks the culmination of joint effort by the IAF and Indian Army to enable the IAF to operate in the inhospitable terrain of Leh - Ladakh region in support of the Army. On the other hand is the great bonhomie displayed at the borders of Arunachal Pradesh, where the Indian contingent led by Brig C P Mohanty was welcomed to the 60th Anniversary Celebrations of the Chinese People’s Republic with much warmth opposite Bum La in the Towang sector by his Chinese counter part, Col Yang Zi Zing, hardly actions by an army likely to wage war on a country. So it is time that those who are skeptical of the capability of the Indian military readiness to face the China challenge to take a hard look at the facts before opinionating. Matters military are far too serious to be left to the judgment of those who may not have practiced or studied the subject more intensely.